Lately I have such a hankering for “Mexican” flavors. I use the quote marks because what I make has no claim to authenticity. Yet it is so much better than the gloppy messes on offer in most of the so-called Mexican restaurants here. I usually do a plate with (1) brown rice; (2) refried beans to which a can of diced green chilis has been added; (3) a vegetable. And then I top it with all sorts of good things. 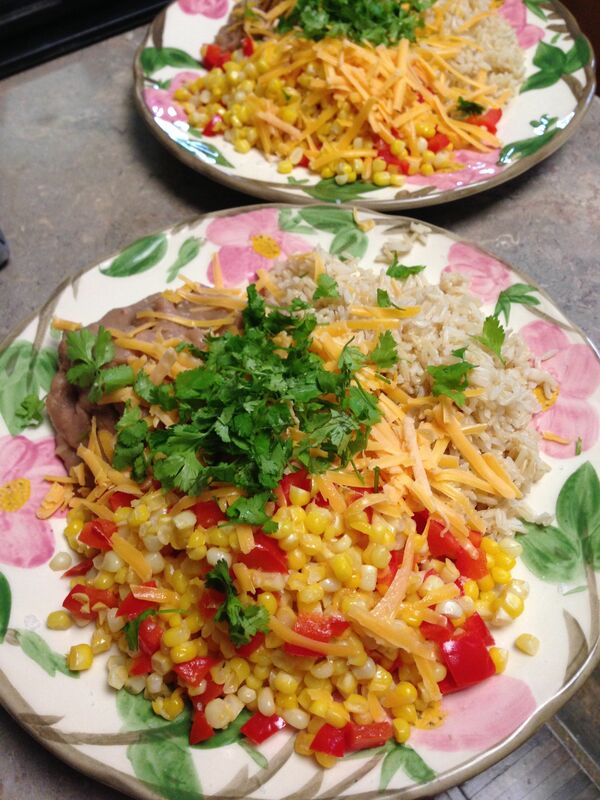 Brown rice, beans, sweet corn with red bell peppers, cilantro, lime juice and cheddar. Closeup of the delectable corn kernels. I love the colors in this. Many people hate the taste of cilantro, but I think it’s delicious. I have been known to make my own refried beans, but it’s too much trouble when you can get tasty ones in a can. I prefer the kind that still has a few whole beans in it. Here’s another variation with chopped garden tomatoes and grilled summer squash slices. This is really satisfying on a hot day with a cold beer. 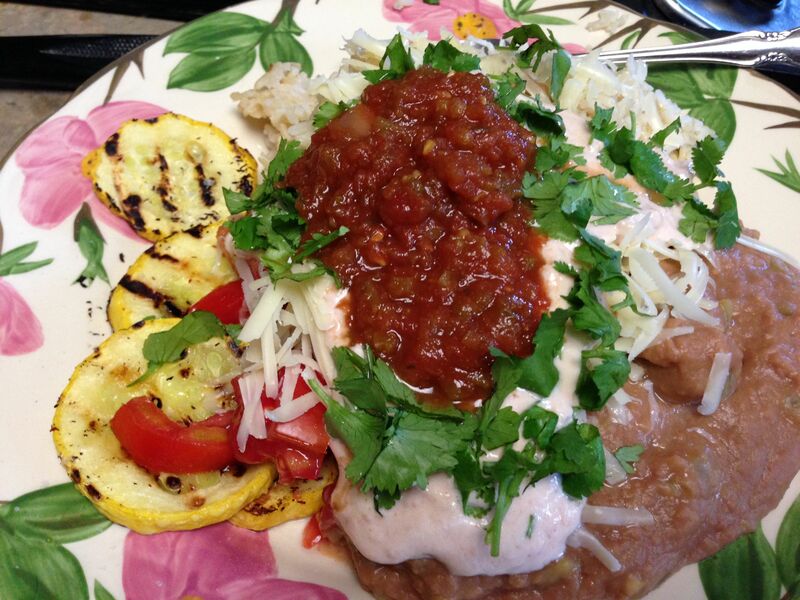 It’s garnished with salsa, plus Greek yogurt mixed with a little salsa. I love cornbread, so I tried this one with green chilis, baked in a skillet, from Mark Bittman’s How to Cook Everything Vegetarian. More Southern USA than Mexican, I think. 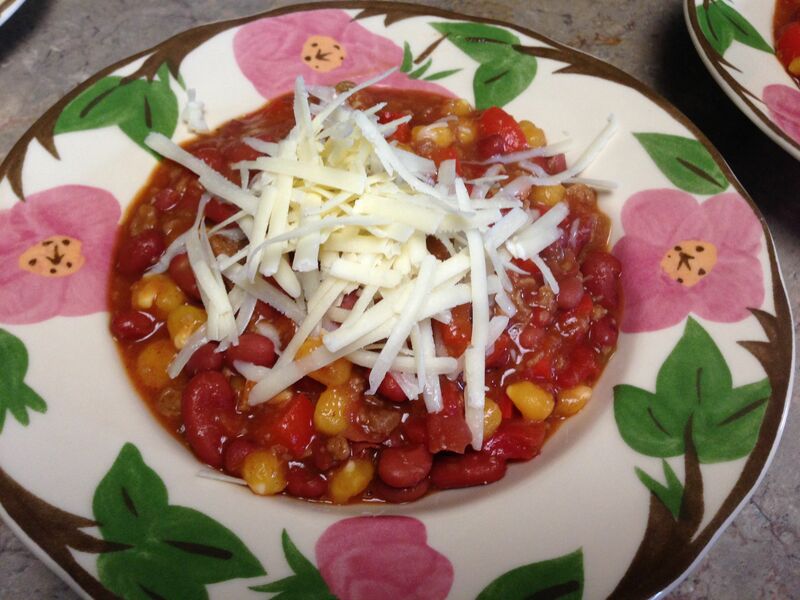 Another favorite with Southwestern flavors is vegetarian chili. 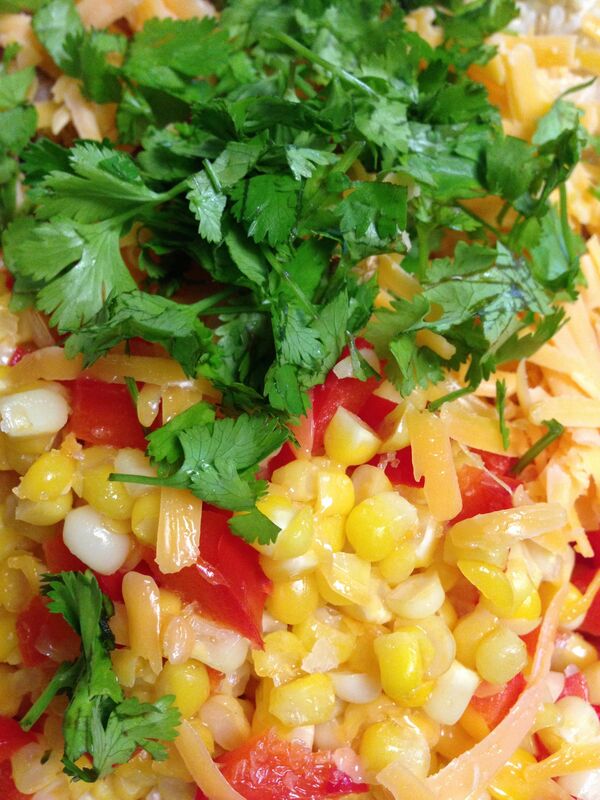 This one has sweet corn and Boca meatless crumbles. 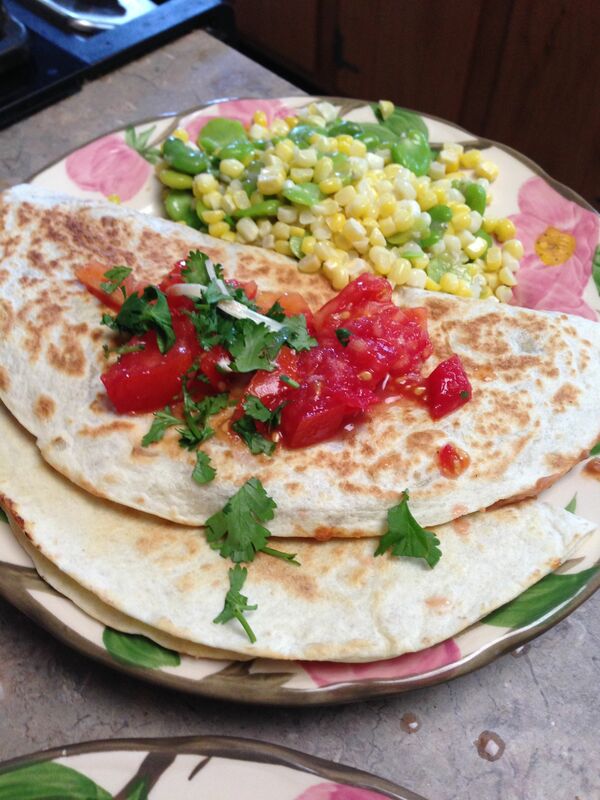 I only make quesadillas once in a while because of the carbs. But they are hard to resist. So are burritos. Oh man… all that looks so GOOOOOOD! (Doesn’t help that I’m waiting for my friend to txt me about where and when we’ll be meeting for lunch today, and that I’m already starving). LOL. It’s early morning for me. But by lunchtime I’ll be hungry for this. Oh, yumm, all of this looks delicious!! Me too. I’m starving at the moment. Here in Sweden, so-called “Mexican” food has a whole shelf in most supermarkets and it’s a standard Friday evening family TV dinner. I prefer your version. It looks great! It’s a funny thing about cilantro (or coriander as it’s also known) – people either adore it or loathe it. Nothing in-between. That is so true, Robb. Some people say it tastes like soap. Maybe it’s a genetic difference. Here we call the leaves cilantro and the seeds coriander. I love them both! I know! I’m in the “adore it” camp. It’s down to a set of olefactory genes that anywhere from 4-14% of people have, and those people can detect the organic molecules called aldehydes that are present in cilantro, and also in soap. 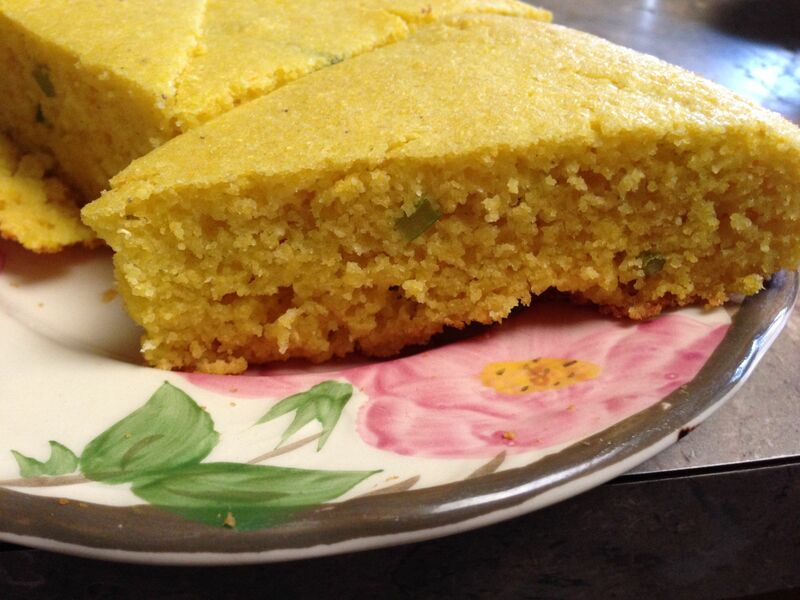 The cornbread would be nice right now with some milk for a light breakfast. Yeah. I love cornbread, but don’t make it often enough. Cilatro… hm love it in moderation, just because i am not too fond of the aniseedy tang of it (same with basil and fennel, nice in small portions). Can’t have guacamole without cilantro though! But wish there was less of it in Indian food. That’s right, Indian food uses it too. And Vietnamese food. I wish I could do more chilis. I love the flavor of chilis but I can’t take much heat. That’s one reason my food is not very authentic! My Mexican friends told me it is a question of building up your taste buds. Contrary to what people think chillies don’t actually do any damage to stomach, that is if you don’t suffer from ulcer or anything like that 😉 I found what they were saying to be true, once you eat a lot of hot food you get used to the hotness and taste more and more and the feeling of your mouth on fire is not as strong. I used to be able to eat very hot stuff back then and that from starting from zero as back home we don’t have any spicy food. I tolerate less now because i sadly don’t eat it so often. Also in their authentic food chillies are mostly cooked and not raw and taste very different. I miss mole.. sighhh..
As for the chilis, I have a lot of GI issues, so unfortunately they do irritate my insides. My favorite is chipotle chilis–so much flavor! I’ve not had mole very often. I think it’s usually served with meat, but it would be interesting to try it in a vegetable dish.